Featured Projects | Gordon N. Ball, Inc.
Caltrans Excellence in Transportation Award Winner 2018! State Route 89 Mousehole Pedestrian and Bicycle Improvement Project Ribbon Cutting Event. Hal Stober President of Gordon N. Ball, Inc. in orange vest. Photo courtesy of Sefan McLeod, Stefan McLeod Photography. 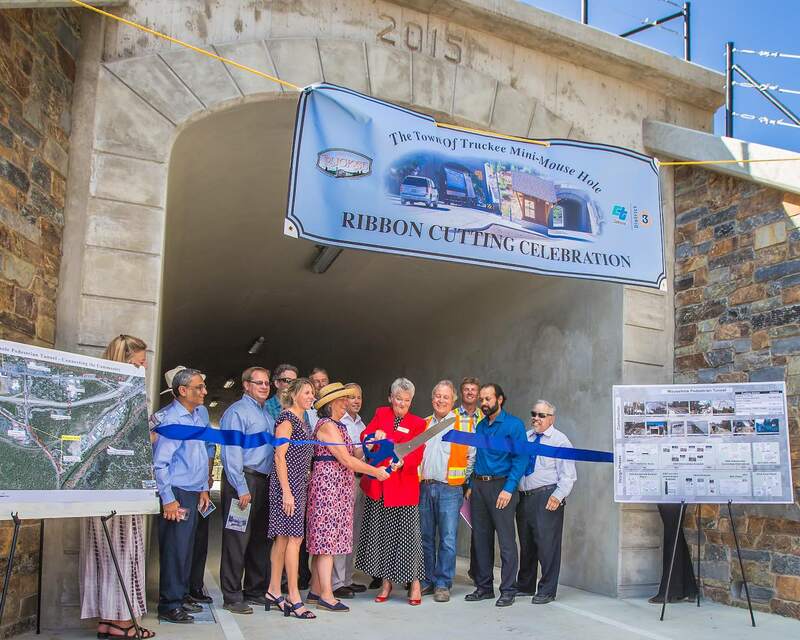 The State Route 89 Mousehole Pedestrian and Bicycle Improvement Project constructed a 12-foot wide pedestrian and bicycle tunnel under the Union Pacific Railroad (UPRR) railway for bicycles and pedestrians who were previously sharing the railroad undercrossing with vehicle traffic. The project is located in the Town of Truckee in Nevada County and is immediately adjacent to the unincorporated portion of Placer County within Caltrans and UPRR right of way. Built in 1928, the existing 24-foot wide concrete vehicle tunnel is locally referred to as the Mousehole because of its arch shape. With two travel lanes of traffic and virtually no roadside shoulders, the absence of any pedestrian or bicycle facility through the Mousehole was of great concern to the community and the region. SR-89 is a heavily used access point connecting Interstate 80 to Lake Tahoe and Truckee. Each year, Caltrans highlights the best of its work and the work of its partners through the annual Caltrans Excellence in Transportation Awards Program. Caltrans received nearly 100 entries from Caltrans districts and programs, public agencies, private contractors, and consultants across the state. Congratulations to everyone who worked hard to make these projects a reality by helping provide positive and measurable improvements in transportation, resulting in a lasting benefit to the state of California. Gordon N. Ball, Inc. was the first contractor in, and the first contractor out, on the $6.416 Billion Caltrans project that replaced the San Francisco Oakland Bay Bridge. The project required construction of highly technical soil improvements, all built to work around the natural tidal action of the bay. The project included the first legal filling of the San Francisco Bay in over 50 years. The project faced very technical and restrictive environmental concerns. Once the project started, it became apparent that the original design would not comply with the environmental restrictions as required. Gordon N. Ball, Inc. developed a new construction sequence with revised methods that enabled the project to be constructed in that was not only in compliance with all environmental requirements, but also still succeeded in completing the project on time and allowing the next sequence of the massive project to start. The success of this project is an example of the innovation and abilities that enable Gordon N. Ball, Inc. to construct very complex projects under very difficult conditions. Uncovered a buried historical wetland with excavation, and restored the scars of a hillside quarry with the excavated material. Gordon N. Ball, Inc. removed soils that had buried an existing wetland during development projects that occurred in the 1960’s. This restoration work was successfully completed adjacent to the shores of Lake Tahoe and the banks of the Truckee River, under extreme environmental oversight and regulations. The grading work required working in wet and unstable areas, all adjacent to homeowners and an operating marina. Gordon N. Ball, Inc. was integral in an innovation to the construction plan that enabled the excavation spoils to be used restoring an old rock quarry that existed within the Tahoe basin This accomplishment doubled the environmental and public benefit of the project. Gordon N. Ball, Inc. implemented their experience and expertise from past difficult projects to perform extremely difficult grading work for both the east and west portals, and the roadway and median transitions to the new bore alignment. The work was executed with very limited access, over and around congested public traffic, through hard rock soils, and alongside a team of multiple project partners with varied objectives and schedules. In the last 10 years, Gordon N. Ball, Inc. has successfully completed 7 individual projects with an aggregate value of over $27 million at Mission Bay. The projects were constructed under a quasi-private/public contracting model, and required adherence to very strict local hiring and local subcontractor participation requirements. The projects were constructed under very challenging working conditions, with very unstable soils and foundations, underground debris fields, and high groundwater. When the first contract began, there was minimal construction activity in the area and very little industry knowledge and experience with the working conditions and rules. By the time the latest projects were completed, the working conditions were controlled by the requirement to synchronize with the heavy building activity ongoing in the area, and the increased traffic caused by the improvements completed to date. The success of Gordon N. Ball, Inc. at Mission Bay is an example of the ability of management to successfully integrate and apply its experience and knowledge to all aspects and intricacies of heavy civil construction. The Devil’s Slide projects are a testament to the abilities and experience of the management and work crews of Gordon N. Ball, Inc. Gordon N. Ball, Inc. successfully completed the first contract for the long anticipated Devil’s Slide tunnel, developing both the access and the footprint for the south portal of the tunnel. An extremely difficult soil nail wall was constructed, under dizzying heights, minimal working room, and steep cliffs or Highway 1 traffic below the proceeding work. Essentially, a retaining wall to build a retaining wall had to be constructed, with all work completed safely and on time, under strict environmental controls, so that the main tunnel work could proceed. As the original contract work was winding down, a winter storm caused a major landslide near the work area, closing Highway 1 to public traffic. Because of the impressive work just completed, Gordon N. Ball, Inc. was selected to respond to the emergency situation, and working with the unstable conditions and minimal access, was able to open the highway back up to traffic approximately 4 months sooner than Caltrans had promised the public. Finally, when the prime contractor (Kiewit) and Caltrans needed an expert contractor to complete an incredibly difficult grading and backfill task at the north portal of the tunnel, Gordon N. Ball, Inc. was contracted to remobilize back to the area to develop its own access and place a large reinforced earthen sliver fill, all under very steep and tight working conditions with extreme environmental controls.